The Department of Computer Science has a well-rounded, highly competitive program that will prepare you for both graduate school and positions in industry or government. We are the Center of Academic Excellence in Information Assurance Education as well as a funded Master of Science in Information Assurance Program. The Department have strong collegiate and corporate partnerships. Most of our CSC/CIS students take advantage of the many available summer internships (both industry and research) which provide opportunities for graduate school and industry positions before graduation. Our faculty have a vested interest in your success and we are dedicated to your future goals in the field of computing. The Department has a freshmen mentoring program, peer-tutoring program, and one on one curriculum advisement to ensure successful matriculation at Hampton University. 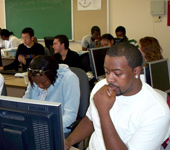 In addition the Department of Computer Science has a 98% placement rate (full-time employment and/or graduate school acceptance for graduating seniors. These students are actively sought by business and government agencies. Click here for a list of general competencies. 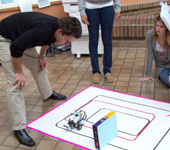 Major industry, government agencies, and graduate schools also actively seek these students. The Department has an enviable record of placing its graduates in positions of employment or in graduate school.